USN Cruiser Tech Tree Separation. Update 0.7.5. 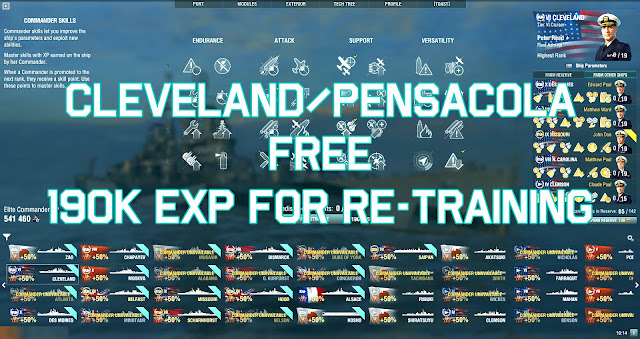 When update 0.7.5 goes live, players who have the Tier VI cruiser Cleveland in their ports will receive Tier VI cruiser Pensacola (with the same or equivalent configuration as the tier VI Cleveland). The Tier VIII cruiser Cleveland. Since Cleveland's commander will be places with the new Tier VI Pensacola. Considering the two ships involved, are significantly different in the choice of optimal commander skills, there will be a special combat mission available from the release of the update until June 29th. The combat mission will require players to complete a single battle in any mode on the new Tier VI Pensacola. Once the requirements are met, players will receive 190,000 Elite Commander XP. This will allow players to reassign the commander skills for free.